10 pcs hard boiled quail eggs, peeled. Place the quail's eggs in a saucepan with enough cold water and bring to the boil. Set the heat to medium, simmer for about 5 minutes. 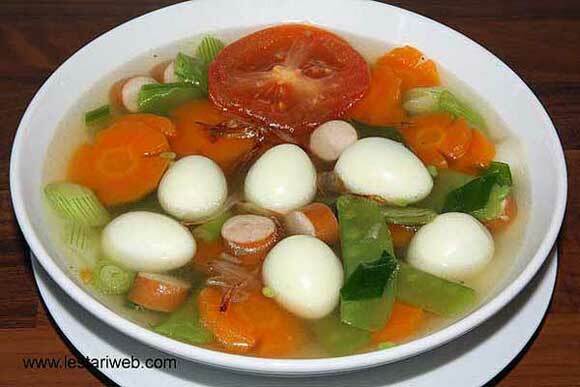 Remove egg and cool it in cold water. Peel off the skin. Heat 1 tbsp oil in a medium saucepan. Stir fry the paste all the time until fragrant. Pour in the water into the pan. Add nutmeg and chicken broth powder. Cover the pan and bring to boil on maximum heat. Add the sugar peas, carrot and sausage. Bring until vegetables are almost cooked. 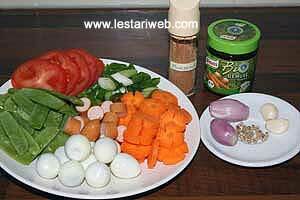 Add the, boiled quail eggs, spring onions and sliced tomato. Add salt and sugar to taste. Garnish with fried onions. Serve right away.